The UFC returns to Arizona on Saturday night with one of the best possible matchups in the entire lightweight division as Dustin Poirier will take on Justin Gaethje in the main event. Poirier is coming off a dominant win over former champion Anthony Pettis as he looks to take another step towards title contention in 2018. Meanwhile, Gaethje is fresh off the first loss of his career and there's little doubt that he's going to try and take out his frustrations from that defeat on Poirier when they square off inside the Octagon. Also on the card, former interim welterweight champion Carlos Condit will make his return to action against late replacement Alex Oliveira, who looks to knock off the biggest name of his career when they clash in the co-main event. Michelle Waterson will also make her return to action as she attempts to stop the bleeding after back-to-back losses when she takes on local favorite Cortney Casey. In today's fantasy preview, we'll examine these fights and several more to see who has the edge going into Saturday night and if there might be an upset brewing at UFC Fight Night: Porier vs. Gaethje. These are the fights that are just too close to call but a few minor differences between favorite and underdog could lead one fighter to victory and the other to defeat. There are no guarantees when it comes to the fight game, but if there was one certainty in the entire sport it's that Dustin Poirier and Justin Gaethje are going to put on a thrilling show in this lightweight main event. Poirier and Gaethje have combined for four Fight of the Night awards in their past five bouts, which sets this up to be another barnburner for the Arizona fans on Saturday night. When it comes to the actual matchup, there are a few key factors that could decide who walks away victorious. For Poirier, he has to stay controlled in the pocket and not get drawn into wild exchanges with a power puncher like Gaethje. At his best, Poirier is a very accurate striker with a ton of power in his hands, but he's also very aggressive when he's pouring on the offense. He has to be careful in those exchanges because Gaethje seems to feast on anybody willing to stand and bang with him on the feet. Thankfully, for Poirier's chances of winning this fight, he's adapted his game very well over the past few fights to use controlled aggression against his opponent. Poirier is still going forward, but he's throwing crisp, accurate combinations rather than winging crazy punches just going for the knockout. Poirier's ability to stay composed and accurate with his striking will be a huge factor in getting the win in the main event. As for Gaethje, he just needs to hope he can draw Poirier into those crazy exchanges because he packs a serious punch and has always shown incredible durability in his fights. Now there has to be a question about how Gaethje will bounce back from a knockout loss after he was finished by former champion Eddie Alvarez in his last fight. Some fighters never look the same after a knockout, although chances are Gaethje is going to be just fine. To make things even more interesting, Gaethje could fall back on his wrestling skills, which are rarely seen in his fights, but it's a weapon he always has in his back pocket. If Gaethje can mix in a takedown or two to keep Poirier honest on the feet, it could really shift the momentum in his favor. That said, Poirier's ability to hit and not get hit in return is the real answer in whether or not he wins this fight. Poirier has worked tirelessly to improve his defense in addition to his world-class offense, and if he's firing on all cylinders, he should have the chance to land enough strikes to eventually put Gaethje away. Make no mistake, it only takes one shot from Gaethje to completely change the direction of this fight, but assuming Poirier can avoid a slugfest, he should find a way to win in what should be an instant classic main event. After an injury to Matt Brown forced him out of the co-main event, former champion Carlos Condit will face late notice replacement Alex Oliveira on Saturday night in Glendale. Oliveira steps into the bout after suffering a loss in his last fight in an absolute war with Yancy Medeiros that earned him Fight of the Night honors at UFC 218. Prior to that setback, Oliveira had won four out of his last five fights, including a knockout over Ryan LaFlare and a submission victory against Tim Means. Oliveira will present a lot of problems for Condit with his long reach, aggressive style and nasty ground game if he decides to take this fight to the mat. The real question with Oliviera is how prepared will he be while accepting this fight on less than two weeks’ notice. Oliveira is a world-class welterweight, but it's never easy to step into a situation like this against a former champion like Condit. That said, Condit is still trying to shake off the ring rust from his long layoff and a mediocre performance against Neil Magny in his last fight. Condit just couldn't seem to pull the trigger in that fight, so he has to be willing to engage more if he's going to win on Saturday night. That shouldn't be a problem in this matchup, however, as Oliveira is a very aggressive fighter who is constantly pressing forward, which should open up some options for Condit on the feet. Condit is a fantastic counterstriker with good reach and tons of power, plus, he has no problem throwing in a flying knee or elbow if there's an opening. Of course, Condit has to be wary of the takedown because Oliveira does have a ton of submissions on his record, so he's not afraid of dragging this to the ground and taking away the former champion's primary way of winning on the feet. Still, Condit knows he has something to prove in this bout and Oliveira's tendency to always push forward with an aggressive offensive output should give "The Natural Born Killer" an opportunity to land some fight finishing strikes. Look for Condit to invite Oliveira into those exchanges before unleashing his signature power shots, and he might even throw in a spinning back kick or elbow for good measure. It all equals out to an exciting fight but one that Condit should be able to win. Michelle Waterson will look to bounce back this weekend as she takes on the always-tough Cortney Casey in a matchup at 115 pounds. Waterson started off her career with a pair of impressive victories, including a win over Paige VanZant, but she's fallen on tougher times lately with losses to Rose Namajunas and Tecia Torres. Now there's no shame in losing to the current strawweight champ and a top five contender, but Waterson has to know the last place she wants to be right now is sitting on three straight losses. To get the job done this weekend, Waterson is going to have to deal with one of the biggest strawweights on the roster, as Casey is a physically imposing force with good striking and an underrated grappling game. Casey's only recent losses came to Felice Herrig by split decision and to former title challenger Claudia Gadelha. In terms of this matchup, Casey will possess several weapons that she will look to use against Waterson. Most importantly, Casey averages nearly two more significant strikes landed per minute than her opponent, so that output will be huge during the exchanges on the feet. Defensively, Waterson has really struggled on her feet in the UFC and that's not a good sign while going up against a fighter who will enjoy a five-inch reach advantage in Casey. For Waterson, she has to be quick on her feet and not allow Casey to bully her around the Octagon. Waterson's ground game is very good and if she can find a way to drag Casey to the mat, she may be able to wrap up a fight finishing submission. Casey has not been good at defending takedowns, so that could be a huge opening for Waterson to get this fight to the ground and apply her grappling game. Getting this fight to the ground is easier said than done and that means Waterson has to get inside on Casey and that may be tough with that reach advantage. If Casey can keep Waterson on the end of her punches and avoid the ground game, she should be able to do enough damage on the feet to get the win in this fight. Casey just needs to be willing to get a little more aggressive than she usually does in her fights so that she can ratchet up the pressure on Waterson whenever they engage in striking exchanges. If she does that, Casey should be able to get the job done. Antonio Carlos Junior will look for his fifth win in a row when he takes on middleweight stalwart Tim Boetsch in Arizona. As a former heavyweight, Carlos is a massive fighter competing at 185 pounds, and that's served him well over his last few fights. While Carlos is always improving every facet of his skill set, there's no surprise that his go-to weapon will always be his Brazilian jiu-jitsu. Carlos sits with Demian Maia and Ronaldo "Jacare" Souza as arguably the three best grapplers on the UFC roster, and there's little doubt he'll look to employ his submission skills in this fight. Boetsch is a bulldozer with eyes when it comes to his style inside the Octagon. He moves forward, he throws with massive fight-ending power and he's as tough as they come when he gets an opponent in trouble on the feet. Boetsch has a wide array of weapons while standing and he's not afraid to throw down with anybody willing to engage with him. For Carlos’ sake, he should probably turn down that invitation to strike with Boetsch and look for the takedown as soon as possible. If Carlos fights with his instincts, he'll drag this fight to the ground and then apply his world-class grappling skills to get a finish. Boetsch has struggled in the past against high-level submission specialists and this could be another case where he ends up on the ground with a grappler like Carlos on his back trying for the finish. Look for Carlos to bide his time waiting for an opening to take this fight down, and once the action hits the mat, they may not get back up again until the referee calls a stop to the contest. 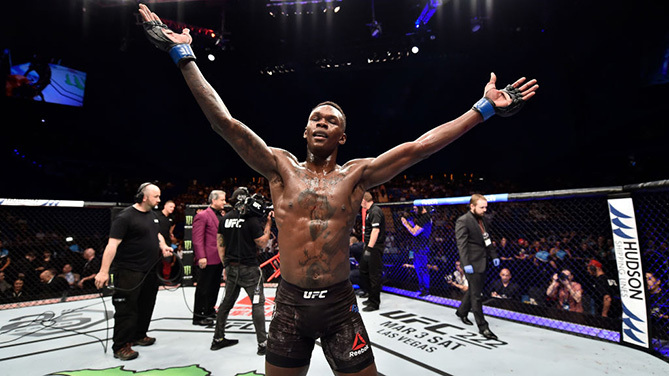 Super prospect Israel Adesanya will make his second UFC appearance this weekend as he takes on Marvin Vettori in a middleweight showdown. Now make no mistake, Vettori will be a tough test, as he possesses a slick ground game and better than average takedowns, which could give Adesanya problems. Vettori is a tenacious fighter who also lands with solid accuracy and volume on the feet. One more advantage in Vettori's back pocket is his Octagon experience, as he's faced a lot of tough competition in the UFC while this is only Adesanya's second appearance. That said, Adesanya has all eyes on him for a reason. The undefeated middleweight prospect is one of the most creative and dangerous strikers on the UFC roster right now, and this is only his second fight in the promotion. Adesanya is punishing with his combinations and he'll enjoy a whopping six-inch reach advantage in this fight, so look for him to use that early to keep Vettori on the end of his punches. Once Adesanya has figured out his range and he's stopped a couple of takedowns, he'll begin unleashing some real fight finishing combinations with brutal speed and power. He's blinding with the way he packages his strikes together, and once he has Vettori in trouble, he'll absolutely go for the kill. Adesanya is a prospect to watch in 2018 and beyond, and this should be another showcase for him to prove that he'll one day become a real contender in the middleweight division. Muslim Salikhov didn't get his UFC career off to the start he wanted with a submission loss in his debut, but the Russian prospect should be able to get back on track this weekend as he takes on newcomer Ricky Rainey on the preliminary card. Salikhov is a dynamic striker with incredible knockout power in his hands and feet, and he's not afraid to take chances when there's an opening that will allow him to show off that versatility on the feet. Salikhov throws with bad intentions with every strike and this time around he should have an opponent who's more willing to engage with him on the feet. Rainey is a solid prospect in his own right, but he's taking this fight on very short notice after replacing an injured Abdul Razak Alhassan. Rainey has a solid resume with wins over some tough competition, but stepping into the lion's den against Salikhov on a week’s notice doesn't bode well for him in his debut. If Salkhov can find his range and start uncorking his full striking arsenal, look for the Russian to set the pace and then put Rainey away before the final bell sounds. Krzysztof Jotko will look to bounce back from two consecutive losses when he takes on Ultimate Fighter veteran Brad Tavares this weekend. To Jotko's credit, those two losses came in a very close split decision to David Branch and then arguably one of the greatest comebacks in UFC history when he suffered a knockout to Uriah Hall after the Polish middleweight was dominating the early portion of the fight. Prior to those setbacks, Jotko had won five fights in a row, including a victory over former title challenger Thales Leites. As for Tavares, he's admittedly looked better than ever in his past few fights, but the Hawaiian middleweight has always seemed to run into a brick wall whenever he's finally challenging a top 15-ranked fighter. Tavares has suffered losses to current champ Robert Whittaker, Whittaker’s next opponent Yoel Romero and he also fell to Tim Boetsch back in 2014. Currently, Tavares is riding a three-fight win streak but this will really be the test to tell if he's ready for the top 15 or if he's always going to be on the outside looking in. By all indications, Tavares has a great chance to shine this weekend as he draws another striker in Jotko, who should be willing to engage with him on the feet. Tavares has looked sharp with his striking in recent fights, favoring a more surgical approach to his offense rather than just biting down on his mouthpiece and swinging for the fences. Tavares has to know that Jotko has plenty of pop behind his punches so he can't underestimate his opponent, but if he stays as composed in this fight as he's done in his past three wins, the Hawaiian should be able to get the job done over three rounds. The real key for Tavares is not allowing Jotko to set the pace, find his range and take over those striking exchanges on the feet. Jotko will enjoy a three-inch reach advantage and absorbs almost a strike less per minute than Tavares on the feet. Tavares can ill afford to let Jotko settle into a rhythm and then unleash his best combinations on the feet. Still, Tavares has looked more composed in his recent win streak than he ever has before, and as long as he's smart with his strategy, he should be able to get inside and hurt Jotko to the body before going back up to the head. If he does that enough over three rounds, Tavares should score his first win over a top 15 opponent.